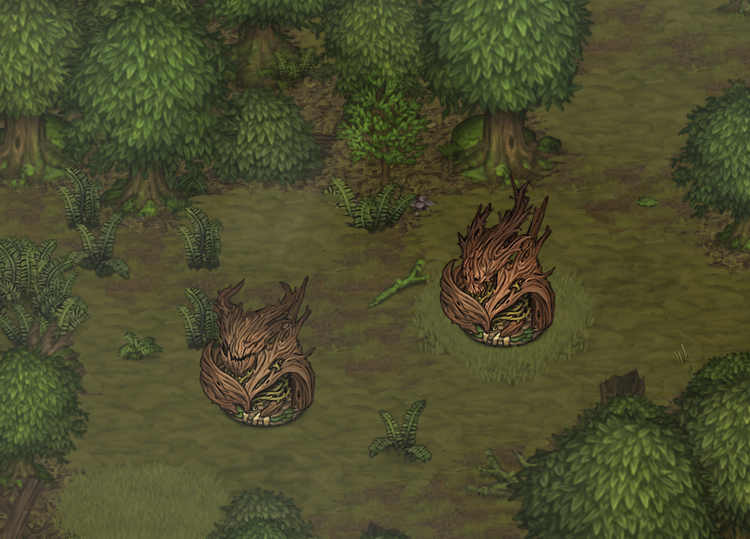 Hostile plant life makes its entry into the world of Battle Brothers in this week’s edition of our dev blog for the upcoming ‘Beasts & Exploration’ DLC. Get your axes ready! The Waldschrat, or Schrat for short, is a fabled living tree found in the most remote forests of the world. 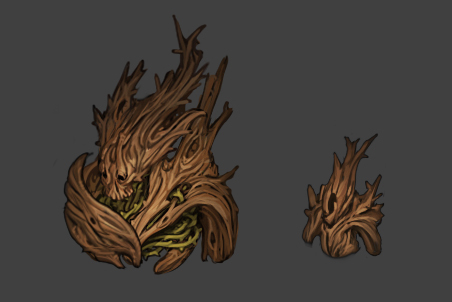 A creature of bark and wood, it resembles no other, and its mind is truly alien. It blends between trees and shambles slowly, its roots digging through the soil. A frightening night time story tells of how trees watered with the blood of the unjustly killed turn into twisted living trees, out to strangle and choke the life out of children that don’t behave. A Schrat can grow limbs at a whim, and so they grow and regrowth what resembles a wooden shield to protect their more vulnerable parts. While this shield is up, they’ll be much harder to hit and damage. The shield can be destroyed like any other with the ‘Split Shield’ skill, and doing so will reveal the Schrat’s much softer innards; although Schrats can be destroyed either way, they’ll take significantly more damage without the shield’s protection. In a surprising twist, then, axes are particularly useful against trees. A Schrat attacks by slamming its thorned roots up from below ground, knocking up and impaling whatever is above ground. It’s an area of effect attack that always hits three tiles in a straight line, starting from the tile the Schrat sits on and going outwards along how their roots grew. Anyone hit will receive the ‘Staggered’ status effect – they’ll be off-balance, scrambling and late to act for their next turn. The Schrat has the potential to inflict a lot of damage when hitting three targets with a single attack, but they’re much less dangerous if you use smart positioning and work around their limitation of only being able to hit multiple targets if they’re in a straight line from it. If a Schrat takes sufficient damage from a single blow to sever a large enough part of them, it will spawn a Sapling upon hitting the ground. They’re miniature Schrats that are much weaker, at least until they’re fully grown in a hundred years or so, but they can still whittle your men down. It’s a trade-off then; fight Schrats with heavy weaponry and they’ll die quicker, but you’ll also have to fight Saplings. Fight with light weaponry, and it’ll take longer to beat down a Schrat, but you won’t have to fight Saplings as well. Me emociona mucho ver que se sigue desarrollando uno de mis juegos preferidos ! Estoy pendiente todas las semanas para ver como va progresando, saludos desde Argentina. Its getting better and better ^^. Great work. Bring on the next Blog!! Wonder If they can “vine”? Such smart design choices ! In the taxidermist house picture we can see a throphy of a Schrat (and other throphies too). I wonder what can be crafed with it. a shield perhaps ;) ? Very nice and original addition old boys! I was so disappointed when you all announced you would no longer add to Battle Brothers. Imagine my surprise when I decided to visit your blog on a whim and saw that a piece of DLC was in development. Cheers guys. Glad to know one of my favorite games of all time is getting an update.